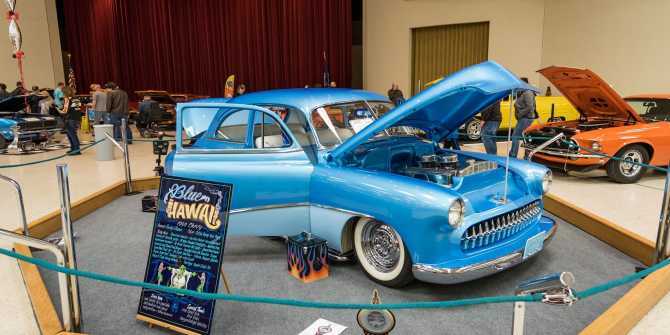 A Wichita tradition continues for the 62nd year in a row as Cars for Charities Rod & Custom Car Show graces Century II Performing Arts & Convention Center Jan. 18-20. This show is one of the longest-running indoor car shows in the country. It started in 1957 under the direction of car builder Darryl Starbird, and in 2011, was sold to Cars for Charities Co., a 501(c)(3) organization run by a dozen local car guys who share a passion for local charities and a love for cars. Below, you’ll find everything you need to know about attending this year’s premier car show in Wichita. Jan. 18 – Noon-8 p.m.
Jan. 19 – 10 a.m.-9 p.m.
Jan. 20 – 10 a.m.-5 p.m.
Top show cars from around the country come together for the biggest, longest-running car show in the region. This family-friendly event also features vendor exhibits, live entertainment, children’s activities and fun for all ages. This event showcases the best and most incredible vehicles shown for the first time in Wichita. The winning vehicles and owners will be awarded $17,000 in cash and trophies. All Mag 7 finalists will win $2,000 and the top dog receives $5,000. Contenders are also treated to a “Cocktails & Chrome” VIP party. Winners will be announced Sunday at 4 p.m. Spectators and fans can sponsor a trophy and pick their favorite vehicles by signing up online. For a look at other events, check out our calendar of events page as you plan your trip to Wichita.